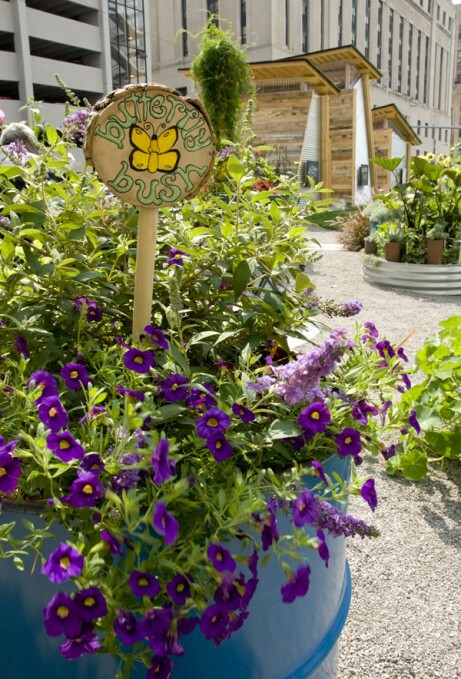 The Children’s Garden is an important component of Lafayette Greens. 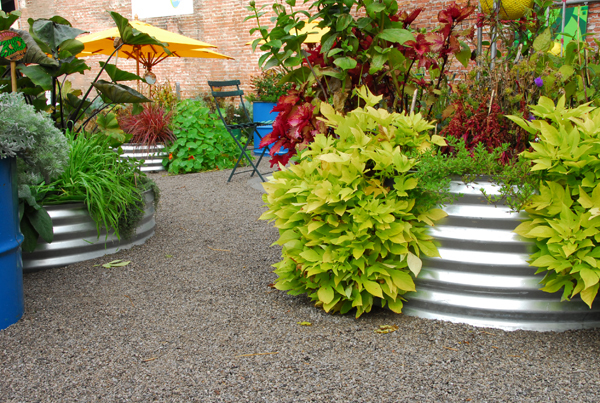 In a garden of strong angles, geometric shapes and steel, this space is round and friendly, signaling it as a special garden within a garden. 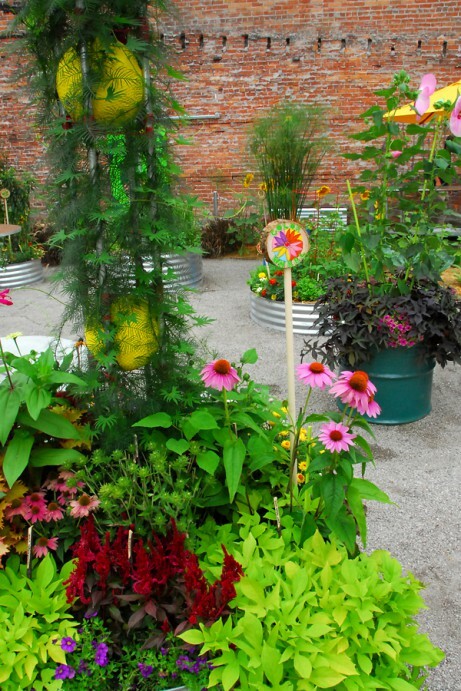 Conceived as a nest – a sheltered space in a busy urban environment – the Children’s Garden is enclosed in a circle of thornless blackberry bushes and sunflowers and holds a maze of round colorful planters. Small and circular, the repurposed juice barrels and galvanized fire rings set at various heights are easily accessible to children of all ages. Although this garden is only 38 feet in diameter, it’s themed planting scheme offers a rich educational experience in a small space. 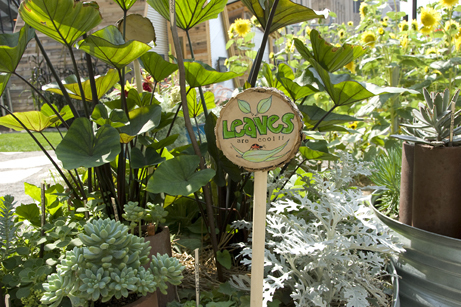 The Children’s Garden is planted with over 100 different and unique plants inviting visitors to explore an incredible diversity of plants. 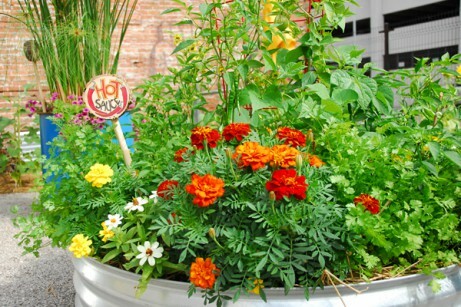 Each planter has a theme such as ‘The Petting Zoo’, ‘Purple Pandemonium’ , and ‘The Salad Bar’ that fill the planters with colors, textures, tastes, scents, forms, and plant names from A to Z. 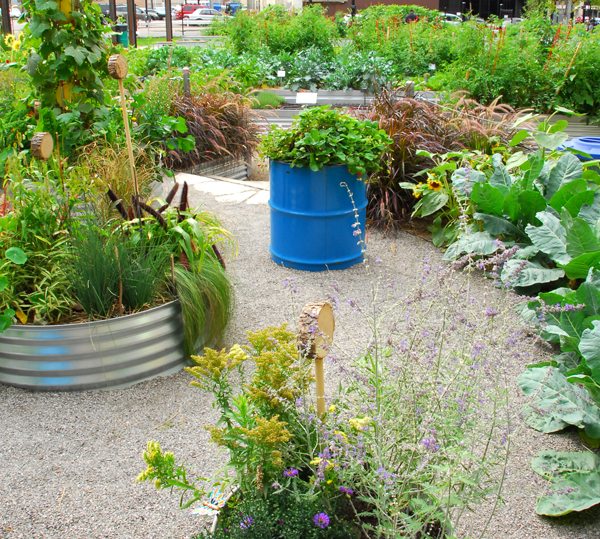 Educational opportunities range from learning how food grows, gardening skills, and nutrition, to lessons in history, science and art. 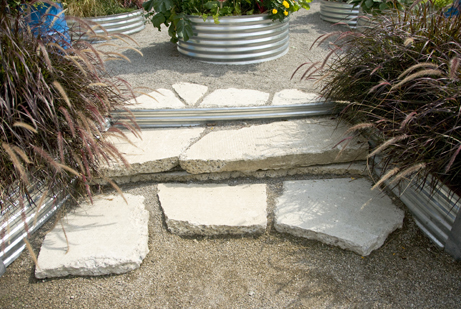 The garden is constructed from inexpensive and common materials. 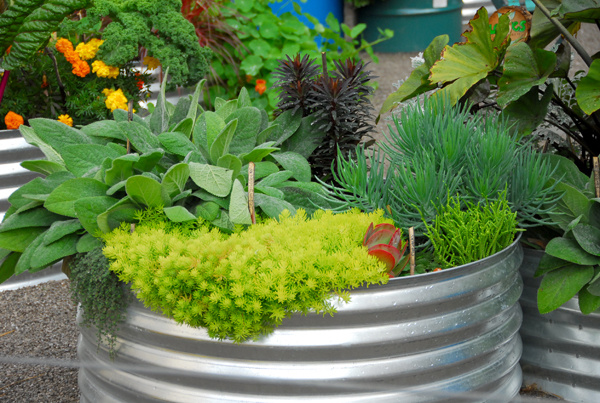 55 gallon drums that used to hold juice concentrate and galvanized steel fire rings make simple planters that overflow with plant life. 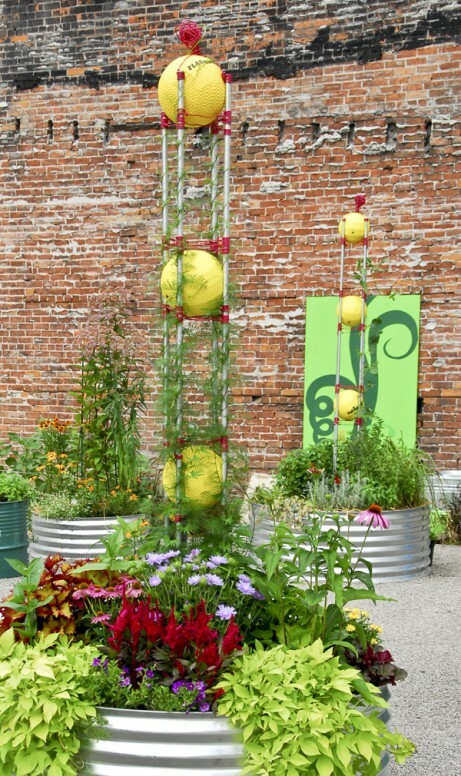 Fun towers that support climbing plants are made from electrical conduit and yellow playground balls and are a clear sign that children are welcome here. The soft, fuzzy and irresistible flower plumes of Purple Fountain Grass offers a friendly welcome at the entrances to the Children’s Garden where exploration and touching is encouraged. Filled with over 100 plants to discover the kid-sized planters are designed to draw children into a world of wonder and delight as they circle round and round in a small but richly textured garden just for them.